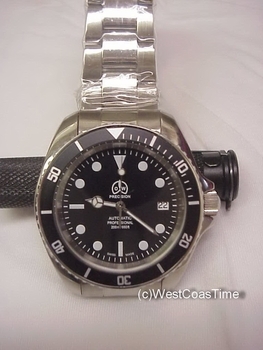 This watch was made by the respected Albert Wajs of Switzerland of Ollech and Wajs who have manufactured durable and collectible military watches for over 50 years. This watch cannot be bought elsewhere in the US; the dial has some military style. SIZE: It is 41.5 mm in diameter without the crown and 47.0 mm lug to lug. It is 14mm thick. Yes the dial markers are ALL superluminova – for you assurance of good use in dim light situations and night time as are the Hands . . This carries a 1 year Limited Warranty – against defects in workmanship. Payment Paypal and other methods ships the next day, by Priority Insured mail for 12-14 usd or if worldwide Express for 50 usd your choice.